3DPrinting: Print virtually anything you want, from virtual files – all you need is the digital design and the materials to feed the printer. 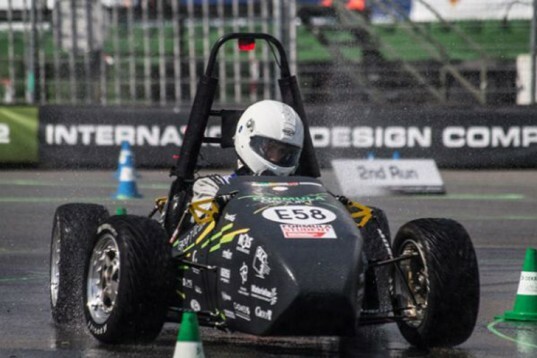 Belgian Formula Group T have taken this technology even further for Formula Student’s 2012 challenge, 3DPrinting an electric car. It is completely electric, powered by a 50-volt lithium-ion battery pack and an 85kw motor. It weighs 617 pounds and can go from 0 to 62 in 3.2 seconds, reaching a top speed of 88 mph. ‘The students are to assume that a manufacturing firm has engaged them to produce a prototype car for evaluation. The intended sales market is the non-professional weekend autocross or sprint racer…The teams must demonstrate the logic behind their assumption/proposal and must be able to demonstrate that it can support a viable business model for both parties. The cars undergo a number of tests, including a rain test in which the car is sprayed with water for an extended amount of time. Things such as safety, acceleration, and fuel efficiency are also tested. The car took just 3 weeks to go from design to production – the 3DPrinting process certainly sped this up. It has already completed races in the U.K. and in Hockenheim, Germany, where it won 11th place. 3DPrinters are creating a manufacturing revolution – the cutting-edge technology will allow at-home manufacturing and facility of production like never before.